I’ve been a pretty busy girl today. I mentioned that we’re moving to a new place earlier and the hectic to do of packing, lifting, pushing boxes, furniture and whatnot has really been taking it’s toll on yours truly. It’s also making me forget that we now have less than one week until Christmas. I would much prefer to be doing this at a much better and more convenient time than 6 days until Christmas, but as it’s not up to me, I’ve been keeping a stiff upper lip about it and soldiering on. If I could afford it, I’d literally pay for a team of big strong (and preferably very attractive) men to pack and move all the stuff for me, then also unpack it. But unless theyd’d let me pay them in food that they buy and I cook, I doubt that’d be a price I could afford. Maybe we should go back to the old days when instead of paying for services with cash, you’d barter with somebody with something of value that you could offer or provide them with. You can tell I really hate moving. Hate it with a passion. As huge an undertaking as baking, photographing and writing up these posts for the Christmas series is, it’s a welcome distraction from the strain of moving from one place to another. This morning I woke up bright and early to finish photographing the last few recipes for the series. It seems crazy to me that we’re nearing the end but we are. I’m super happy with how it all turned out, and I even feel a little bit proud of myself, considering that I had to squeeze them in while in the process of a move. Today I’m bringing out more cookies for you guys. Butterscotch is a polarizing flavor, I’ve found. It’s very rich and sweet. As such, people either love it, or they…don’t love it. 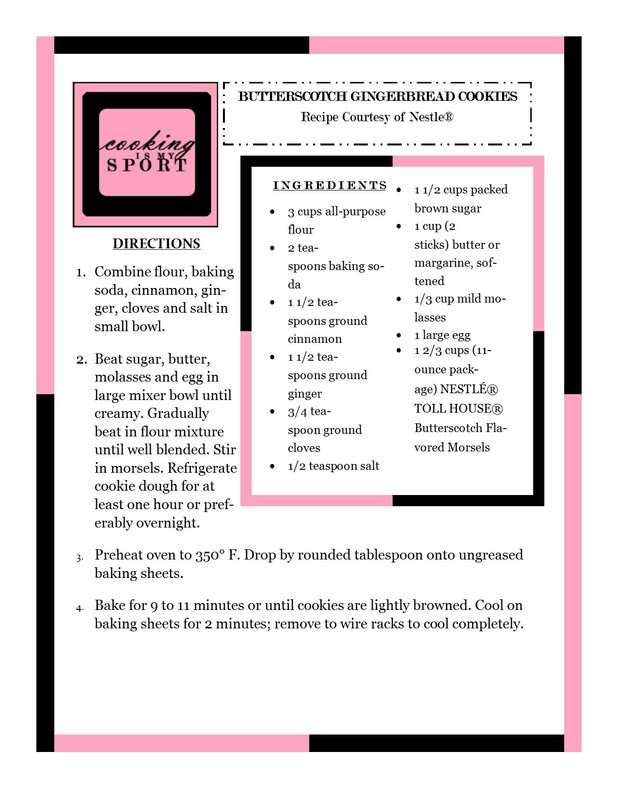 I’m one of the people who happen to enjoy it, which is why I pinned this recipe to try out a long time ago. This cookie is for the “soft and chewy” cookie fans. The spices of your typical gingerbread cookie meet, date, fall in love and marry with the rich sweetness of the butterscotch chips mixed into the dough. And I happen to think that they make a super cute (not to mention delicious) “couple”. The party is still going on at this week’s Fiesta Friday #99 Christmas party, cohosted this week by Caroline @ Caroline’s Cooking and Linda @ La Petite Paniere, so I’ll also be bringing these cookies there. Beat sugar, butter, molasses and egg in large mixer bowl until creamy. Gradually beat in flour mixture until well blended. Stir in morsels. Refrigerate cookie dough for at least one hour or preferably overnight. Preheat oven to 350° F. Drop by rounded tablespoon onto ungreased baking sheets. I just had to share these!!! Yum, yum, yum!! My pleasure and Happy Holidays! Wonderful recipe ! I love butterscotch too. Thank you so much- have a great holiday!!! I’m in the love butterscotch camp, although it’s a while sine I’ve had it and I may find it too sweet these days, but in small doses, sure I would still enjoy! Thanks for sharing.